Authoring, Reviewing, Publishing, Hosting and Archiving, this is what stands behind the innovative and fully integrated journal publishing solution ARPHA. 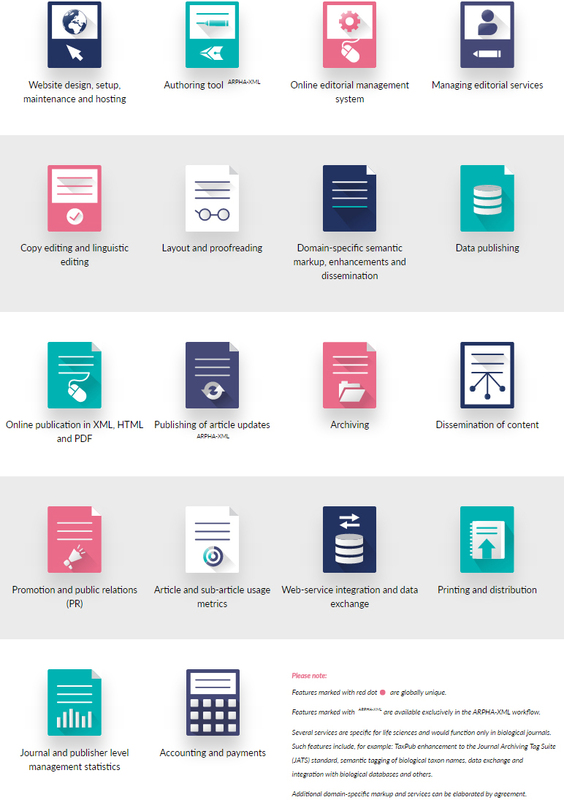 This end-to-end platform not only puts all stages of the publishing process in one place for the first time, but also allows users to choose from a full set of accompanying services. 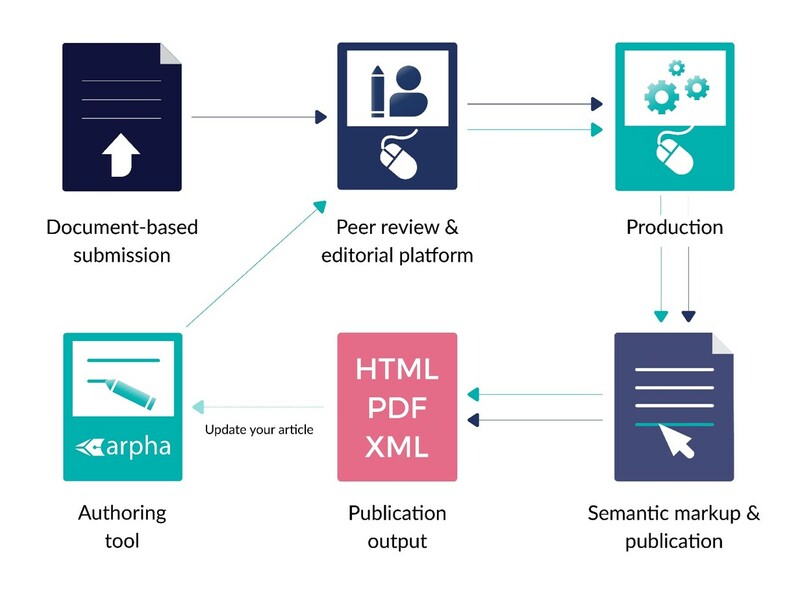 ARPHA-XML: Entirely XML- and Web-based collaborative authoring, peer review, production and publication workflow, made possible via the innovative ARPHA Writing Tool. ARPHA-DOC: Document-based submission, peer review, production and publication workflow. Not only do users have the freedom to choose what suits their needs best, but they also get the options to effortlessly upgrade to our XML, entirely web-based workflow at a later stage, due to the high integration and automatisation of processes within ARPHA. ARPHA is not just a software that you download! This highly integrated publishing solution offers its end-to-end platform, in combination with a full range of accompanying servicesthat you can pick & mix to get a final product adjusted to your needs. Developed and tested in-house by scientific publisher Pensoft, ARPHA now comes as a stand-alone brand and offers a completely white-label publishing option for journals and publishers. 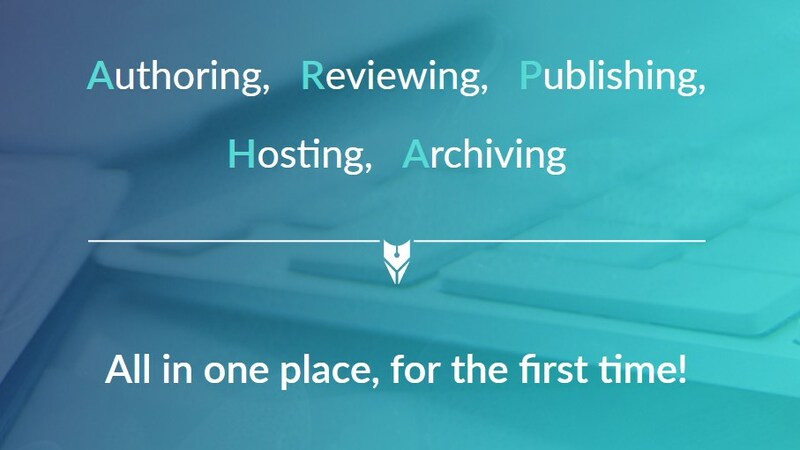 You can enjoy all the benefits of having ARPHA as the backbone of your journal or collection of journals, while at the same time continue publishing under your own imprint. Moreover, switching to ARPHA guarantees you an upgrade of your visual identity by offering dedicated web-design and setup services for your new journal website or publishing platform. 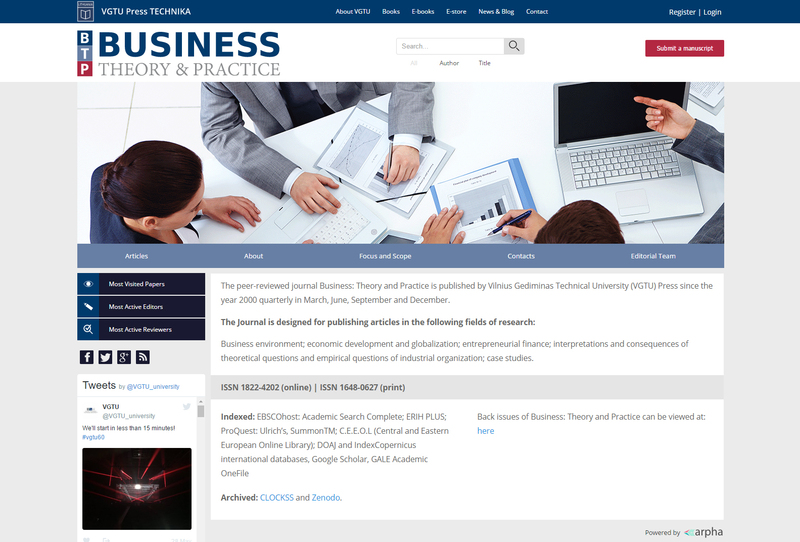 For example, having recently moved to ARPHA, the Lithuanian VGTU Press journal Business Theory and Practice enjoys a brand new, individually designed website. While the journal has the ARPHA Platform as its backbone, it remains a completely separate entity published on behalf of VGTU Press. ARPHA is fully integrated with all leading indexing and archiving services. 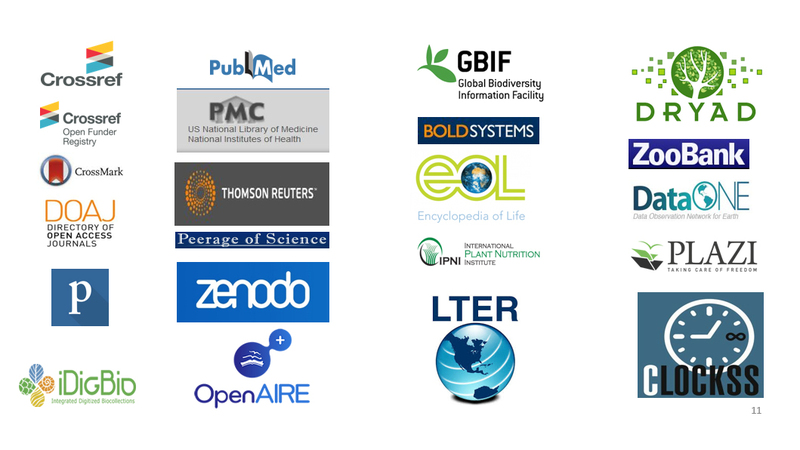 Our partners include CrossRef, Zenodo, Open Ayre, PubMed Central and DOAJ, to name just a few. 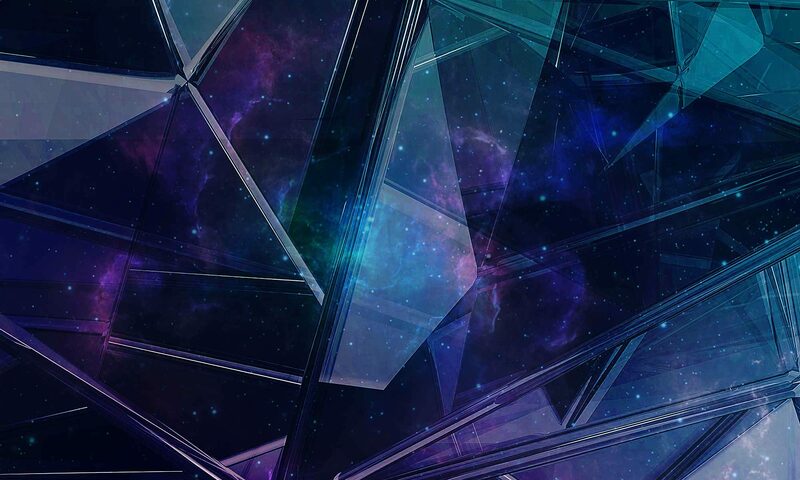 The full automatisation of processes within ARPHA means that all content is directly exported upon publication and without any extra human effort. This means that publishers and Editors-in-Chief can sit back and relax after pressing the “publish-an-article button”, while ARPHA makes sure that all their content is safely archived and successfully disseminated. One of the greatest assets of ARPHA is its flexibility, when it comes to tailoring the best service for each individual client. While deciding what suits their needs, publishers and Editors-in-Chief get to choose from a full range of options at each step of the publishing cycle. 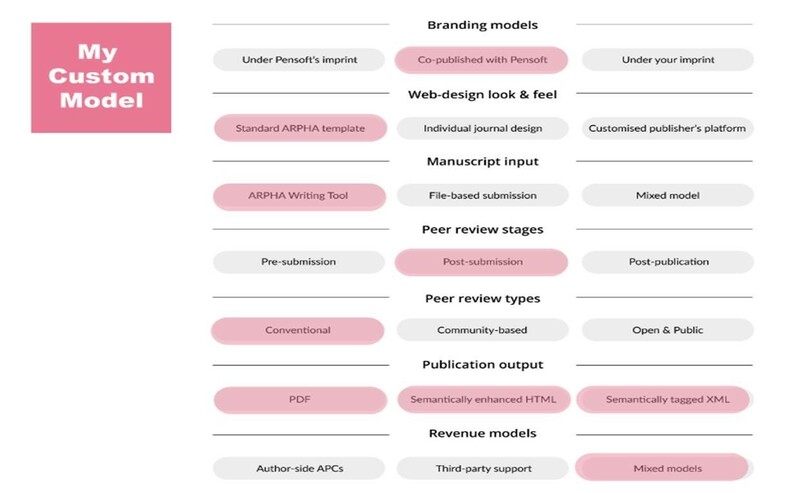 Starting from the branding model and tailored web design, through input types, peer review options and publication outputs, and finishing with your preferred revenue model, ARPHA offers a number of possibilities at each step to let you customise a platform that works for your journals at an affordable price. ARPHA is a home to several flagship journals, such as Research Ideas and Outcomes (RIO) Journal (SPARC Innovation Award Winner for 2016), ZooKeys, Biodiversity Data Journal and others.You may also find some concise information about ARPHA in this flyer. Would you be interested to set up a call for a brief demo? Please do not hesitate to contact us at info@arphahub.com if you wish to explore opportunities to use ARPHA as a new home for your journal!